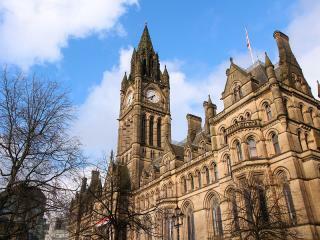 Located in northwest England, Manchester is the United Kingdom’s sixth largest city and is approximately 55km or just over an hour east of Liverpool. Once a gloomy town and the birthplace of the Industrial Revolution, Manchester is now a popular holiday hotspot renowned for its thriving cultural and music scene and contemporary urban design. Manchester accommodation is conveniently located close to the city’s most popular activities and attractions and ranges from budget options to luxury 5 star hotels and family friendly accommodation. Home to fantastic shopping, world-class museums and Britain’s richest football club, Manchester offers something for everyone.